This 10-CD collection includes all five critically-acclaimed volumes, released individually over the last five years, repackaged in a new slipcase. Complete with extensive analytical liner notes from both the pianist and his longtime colleague and producer Gunther Schuller, this landmark set celebrates Sherman’s 70th birthday. A Boston piano icon and Distinguished Artist-in-Residence at the New England Conservatory for more than 30 years, Sherman is known for his risk-taking interpretations of works like Liszt’s Transcendental Etudes and his seminal text Piano Pieces published by North Point Press. He began his studies at age six in New York and, by age eleven, was studying with Edward Steuermann, a pupil and friend of Ferruccio Busoni and Arnold Schoenberg. Sherman graduated from Columbia University at age 19 and went on to a brilliant career in both performing and education, including a stint as Visiting Professor at Harvard University. Sherman has been called “simply one of the best pianists in this or any other country” by The New York Times, and his playing has received stellar reviews in the Boston Globe, Washington Post, Chicago Tribune and the New Yorker among many others. The five 2-CD volumes of his Beethoven Piano Sonatas have garnered numerous five-star ratings and mentions on annual top ten classical lists. Each volume contains sonatas from Beethoven’s early, middle and late periods, thereby exemplifying both their similarities and their differences. 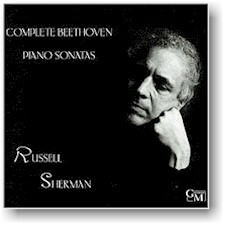 Words like eloquent, thoughtful, powerful and luminous have been used by prominent critics to describe Sherman's unique interpretations of these diverse and oft-recorded sonatas "Simply one of the best pianists in this or any other country." "Sure, the market is glutted with recordings of Beethoven sonatas, but there's always room for interpretations as imaginative and endearing as these." "Sherman belongs among the elite of Beethovians. He is a visionary artist, shedding new light and offering new insights into music that has been heard countless times."